Construction of The Press Building in midtown officially kicked off Tuesday on a site occupied for decades by a parking garage for The Sacramento Bee. Covering an entire city block at 21st and Q streets, the four-story complex will include 277 apartments ranging from studios to three-bedrooms. It will feature amenities not typically found in an urban complex, including a resort-style pool, outdoor kitchens, fitness center, pet spa and package lockers. 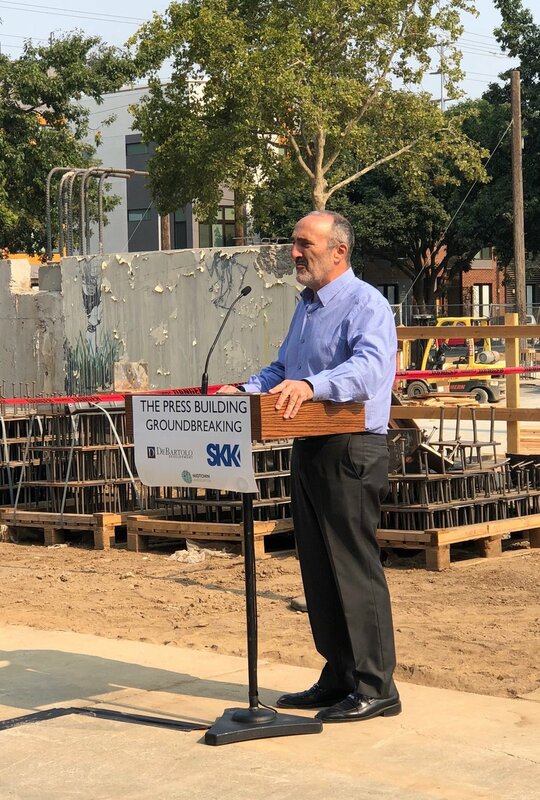 Mayor Darrell Steinberg joined Vice Mayor Steve Hansen and developer Sotiris Kolokotronis on Tuesday, Aug. 21 in a press conference to celebrate the launch of the project, which is expected to open in early 2020. Also represented was DeBartolo Development, owned by the same family that controls the San Francisco 49ers. The Press is the first investment in a Sacramento housing project by the Florida-based DeBartolo Company, but Vice President Scott Waddington said the firm will build more here. "It's hard to miss the symbolism of where we are today," said Mayor Steinberg. "For the past 25 years, this entire block has been occupied by a parking garage. The devotion of such a large piece of land to cars typifies the old Sacramento. "The Kolokotronis family has been building the new Sacramento, block by block, starting with the Fremont Building, which marked the start of our urban Renaissance." Kolokotronis said that he and his partners -- Debartolo and The Grupe Co. -- currently have 500 housing units under construction in the Central City and expect to break ground on another 1,000 within a year. Projects currently under construction in the blocks surrounding The Press include the Q19 apartments and the 20PQR rowhouses. Kolokotronis recently became a leading partner in developing the northeast corner of 10th and J street, which has been boarded up and blighted for a decade. Waddington said his company was drawn to Sacramento by Kolokotronis, one of the first Sacramento developers to focus on rebuilding the Central City. "We're committed to investing more dollars here not only through capital but also as co-developer on some of these projects," Waddington said. While the apartments at The Press will rent for market rates, Mayor Steinberg said the sheer scale of the project will have a moderating effect on rents in the downtown area. Sacramento has experienced some of the steepest rent increases in the country. The Mayor is actively exploring solutions such as reducing fees for construction of affordable housing, rent stabilization and increasing the size of the city's Housing Trust Fund. "We need all types of housing," Mayor Steinberg said. "the more supply we have the more affordable it will be."